A new study just released shows International buyers chose SW Florida over other top destination when purchasing real estate in the United States. The study researched 97 metropolitan markets and was conducted by DataQuick and Inman News. Lakeland-Winterhaven scored #1 followed by Cape Coral-Fort Myers and #2 Phoenix came in at #6, New York City #7, and Honolulu at #8, so SW Florida edged out some pretty nifty places. 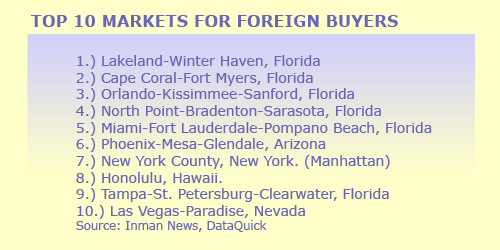 For the past few years we’ve been reporting that International buyers have been buying here locally because Florida is on Sale and they know it. Our prices were too high in 2005 and needed to come down, but they over-corrected in the correction and became artificially too low. Most pros knew back in 2005 prices were too high and not sustainable, and almost everyone in the business recognized a few years ago that prices were too low. In fact, they were so low builders couldn’t compete, so they didn’t. Builders sat on the sidelines for a few years, but they are coming out of their shell now. While everyone agreed prices were too low, nobody really knew exactly when those prices would begin to rise. We predicted 2009 would see bottom, but that the bottom wouldn’t be a nice curvy slope back up, but rather a rocky bottom filled with ups and downs. We did manage to bounce along the bottom, but in the past year we’ve seen evidence of some nice increases. In fact our median prices are up about 30% over last year. Inventory is declining, and builders are building again. Construction adds jobs to the economy, which also fuels the housing market. Nationally real estate accounts for 32% of the nation’s GDP. Each new construction adds 3 jobs to the economy and adds about $90,000 in wages to the economy. While our recovery won’t happen overnight, it is underway and a welcomed sight. Foreign buyers will continue to invest here until prices rise so much that our normal economy sustains itself. At that point, we won’t need foreign investors. We are seeing many baby boomers investing in SW Florida as well. Many would like to retire here and are buying property at today’s low prices so they can afford to live here down the road. We’re also a pretty nice place to visit, both in the winter and year round. SW Florida is certainly warmer in the winter, and we also boast year round boating, fishing, beaches, golf, and more. You can fish year round up north, but you might need a snow blower, chains on your tires, and an ice cutter to do it. Retired folks love riding bikes, taking walks, or enjoying bocce ball or horseshoes year round, and this is one reason SW Florida will always be a top destination. People who live down here are generally healthier and fitter as they can exercise year round and aren’t shut in. If this article sounds like a chamber of commerce letter it’s because it’s all true. We live here and love it, and apparently people from all over the world do to. As the world discovers our beauty and our bargains, simple supply and demand takes over. Our prices are rising, our inventory is shrinking, and our roads have been busy. Now that season is almost over, we can all take a deep breath and enjoy our roads until the summer tourist season begins, and be thankful SW Florida is back on the map for good things instead of the bust that followed the frenzy. Here’s to good times, rising values, and better fortune ahead. Throw in some low interest rates, and the only thing we could ask for is lower gas prices. Hey, 4 out of 5 isn’t bad. 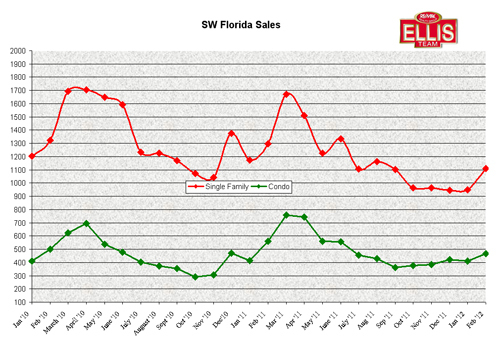 It seems like everyone is reporting that prices are up in SW Florida, but prices only tell part of the story. Supply and demand usually influence prices. Even then there can be variables to this equation. Here’s a little story that illustrates the public’s perception about how Hot a neighborhood is. There is a golf course community in South Fort Myers called Eagle Ridge. I remember back in the late 80’s people commenting that it seemed like the whole neighborhood was for sale. It seemed that way, when in reality about every third home was on the market. 33% of homes in a neighborhood on the market at one time is a big number, and homes weren’t particularly selling well at that time in Eagle Ridge either. It was just a lot to absorb, and 1989-1991 was a different market. Fast forward to several years later, exact date unknown. Another consumer was questioning why they should buy a home in Eagle Ridge when there were very few sales in the past year to compare to. The buyer questioned why nobody wanted to purchase in there and if they were making the right decision. The answer was many people wanted to buy in Eagle Ridge at that time. It just so happened that very few sellers wanted to sell at that time so there were no sales, simply because inventory wasn’t available to sell. We had a good market at that time and Eagle Ridge was desirable. In both instances buyers were questioning a neighborhood’s desirability. In both instances there were very few sales, and yet the reality of the situation was diametrically opposed. While statistics can sometimes be deceiving, we try to provide pertinent stats and describe what is actually going on and what they mean. 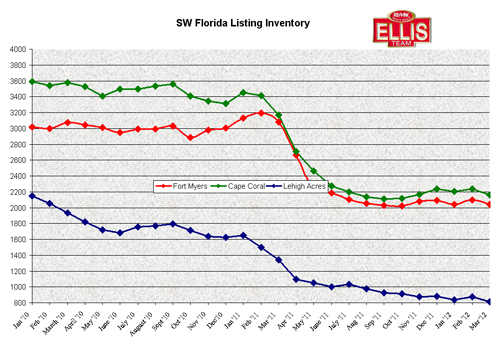 Aside from a few blips, listing inventory has been going down. This is due to the market absorbing and buying up available inventory so it doesn’t stay on the market long, assuming it’s priced correctly, and the lack of enough new foreclosures entering the market. Just as the first waves of foreclosures drove prices down in SW Florida, the lack of foreclosures entering the market combined with a healthy appetite from buyers has propelled prices higher. Just reporting prices without going in depth doesn’t explain to a buyer or seller what’s really influencing the market. Of course all real estate is local. What’s going on nationally doesn’t necessarily affect what’s happening here. The national market was doing OK back in 2006 while we began flat lining. Flat lining would actually have been good; however our prices were headed for more like a cliff. We’ve talked about those reasons in the past at length, and in fact many people on the ball who study the market were warning about what would someday happen with prices. We don’t see those factors in play today, so we believe we can be in for sustainable price increases going forward. In fact, our market may have over-adjusted to the downside as prices were artificially too low for awhile. Our market is correcting those errors now. The market eventually gets it right. The real estate market isn’t as efficient as the stock market, but it does work over time. As prices rise we’ll begin to see more building and we’re already seeing signs of that. Builders have been able to cut costs to compete, as long as they are into the land at decent prices. Closed sales are on their annual march upward. March and April tend to culminate in finishing of a strong season. By all accounts we’ve had a strong season so far, and when we look at pending sales we can see that March/April closed sales will be better. We continue to look for higher prices than last year. Sales numbers would actually be higher if only we had more inventory to sell. The trend is the same even if the numbers of sales are down. This could put more upward pressure on prices going forward. We’ll report soon on pricing trends, and now you have the context ahead of those reports as to what’s moving the markets. You can’t turn on the TV without getting daily updates from Fort Myers on the state of the Major League baseball teams. TV networks love to use the new JetBlue Park, affectionately nicknamed Fenway South as the backdrop. It’s named Fenway South because the field is designed to look like Fenway Park in Boston. There is the green monster in left field baseball fans from all over will remember. The designers took note to match the exact dimensions of Fenway Park when building this new stadium. 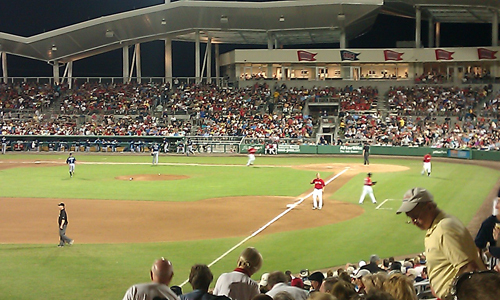 Fenway South a Big Hit With Baseball Fans. Some Lee County residents weren’t happy the county invested $80 million for a stadium that is in use one month of the year when we have such other pressing needs, and there is an argument for that. The stadium was paid for by the bed tax, which is a tourist and development tax. I think it’s fair to say this new stadium has caught the eye of baseball enthusiasts everywhere, and hopefully this translates into tourism dollars coming back to the area. It’s hard to put a price tag on the free publicity our area is getting. On a recent trip to a night game, I noticed the satellite trucks beaming the game up to folks in the New England area. Combine that with ESPN broadcasting games and the daily baseball newscasts from Fort Myers, and you begin to realize this free publicity is worth something. How many people from New England came this year or will in future years? That’s hard to tell. We can say that the real estate market got hot back in October, a full 3-4 months earlier this year. We noticed many northerners buying, and that trend continues to this day. I think people are also intrigued that we have two major league teams here, so maybe there’s something special and worth looking into in SW Florida. Now there’s talk a 3rd team, the Washington Nationals may be interested in relocating here and taking over the old Red Sox stadium. This would come with a price tag as the Nationals would want some of the very same things the Red Sox asked for, like practice fields closer to the stadium. I’m not sure how much more money Lee County has to spend on baseball, especially in light of the fact the Twins are now asking for renovations to their stadium to the tune of about $60 million. They won’t get anywhere near that, but they’ve asked. Their contract says the stadium must be looked at every 5 years, and must be kept up with a certain percentage of the top spring training stadiums. So the Red Sox stadium not only cost Lee County $80 million, but potentially lots more with upgrades to Hammond Stadium. Politics aside, this is a time to revel in the fact that this new stadium has put SW Florida on the map, in a positive light, and after 6 years of making news for a housing crash, it’s nice to make the news for something good. Our housing market is getting much better by the way. All this leads to economic recovery and dollars being spent here locally. While locals hate the traffic, keep in mind season only last a few more weeks, and we certainly enjoy the money spent all year long. I’d say the 1st year of the new stadium was a success, and let’s hope it inspires more people to come here next year. All the visitors bring money to the area, which spurs local jobs, and local jobs lead to economic recovery. It’s all related, and each feeds off the other. We’ve spent the money for the stadium. That argument is over. Let’s reap the benefits, enjoy some popcorn, peanuts, and Cracker Jacks, and cherish the sound of “Play Ball”. Buyers and sellers have decided to Play Ball too. Houses are flying off the market. Let’s root, root, root for the home team and for our good fortune to continue. Happy St Patricks Day to all, and may the luck of the Irish be with you. What a difference a year makes. As you can see from the 2010-2012 Single Family Median Price Comparison chart, January 2012 prices are up 30.86% over last year’s numbers. We’ve been reporting that prices have been on the rise for months and that we thought we could be in for a strong selling season and the numbers are bearing witness to those sentiments. Inventory levels are down which is affecting sales. There are fewer transactions because there is less to sell, which is causing prices to go up. Word is spreading up North too, as snowbirds and baby boomers are looking to buy now before prices go higher. Don’t worry; it’s still a very healthy market. We still have buyers offering $10,000 less on bank owned properties even though there are more than 10 offers on the property and the bank is countering at highest and best. Some buyers just have to try even though their Realtor is advising and educating them on the market. I always get a kick out of buyers that call me because they’re disgusted with their Realtor. Upon asking a few questions inevitably the buyer tells me they’ve made offers on several properties but they never win any of the bids. Look at the price point’s chart. Foreclosure sales are down across the board as foreclosure inventory is down significantly. Conventional sales are up as prices have risen since 2009. Many more sellers can afford to sell today than 3 years ago. You’ll also notice more sales in the higher price ranges. This is because there is less inventory to sell in the under $100,000 range, so those sales are off. That’s pushing buyers into higher price ranges. Additionally, the economy is faring just a little better in some places. Buyer sentiment is stronger, and buyers in the higher price ranges realize if they want an investment or place to eventually retire, buying sooner rather than later may be their least expensive option. These higher priced homes seem like such a bargain compared to 6 years ago, and who doesn’t enjoy a good bargain, even if you’re rich? We look forward to reviewing the February numbers once they’re out. We think February will be another strong month, and already March has been super busy. It should be, as March is the height of season. It’s also the month of St Paddy’s day, so with a little luck of the Irish, our market might just end the season in fine shape. Last week’s article drew much attention from readers all over the country. The article’s intent was to create interest and educate the public about military veterans’ issues, and from the feedback it worked. Follow-Up on SW Florida Military Veterans. We should clarify this. If a veteran has a VA loan and has a short sale or foreclosure on that loan, they will lose their ability to get another VA loan. If they are foreclosed or do a short sale on a conventional loan this will not affect their certificate of eligibility. They are still entitled to their other military benefits. This week we’ll touch on some new items as they pertain to real estate. Did you know that per the Servicemembers Civil Relief Act (SCRA) active duty military and their families are protected from eviction if they lease a house or apartment and cannot make rent. Service members also have the right to terminate a housing lease when they receive Permanent Change of Station orders or when they are deployed to a new location for 90 days or more. There is also protection against default judgments against anyone in the military. This is especially important in SW Florida. Often I am asked to attend evictions and lockout proceedings against former owners or tenants on behalf of a bank foreclosing on the property. Before a court can enter a default judgment against a military member for not responding to a lawsuit or appearing at trial, the plaintiff who is suing the Service member must provide the court with an affidavit stating the defendant is not in military service. Imagine someone working here in SW Florida and being called up to serve and being deployed overseas to Afghanistan or anywhere else the military needs them. They receive regular military pay during that time, not the regular pay they might be accustomed to. Just imagine if they came home and the landlord or bank evicted them while they were gone. How would you feel if this happened to you? For the privilege of serving our country, many service members returned home only to find their houses were foreclosed upon and sold to someone else. That’s quite a kick in the pants. The SCRA creates rights for our Service members, like the right to terminate a lease if they are called, protection against foreclosure, health insurance protection, motor vehicle lease protection, and so on. There are many details that cannot be explained in a short article like this. I would highly recommend Service members contact their local AFLA office or visit http://legalassistance.law.af.mil A quick and easy way to read up on this act is go to www.Military.com and type SCRA in the search box. From there you’ll be able to read up on the entire act. This information is important to Service members, landlords, real estate agents, and the public in general. 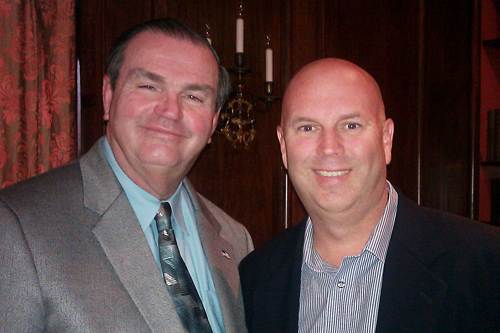 A few weeks ago I met with several military leaders including Brigadier General Earl Jakes pictured above, the civilian assistant to the Secretary of the Army from Texas, and others as we talked about the course and ways to improve the education of agents and loan officers. We hope industry has a better understanding of protecting and meeting Service members needs, because I can assure you, our military is protecting and meeting our needs.